The nimble star fighters of the Rebellion and the Imperium (and some galactics scum and villainy) have fought it out in Star Wars: X-Wing for a while now, and now FFG brings us a whole new scale of spaceship combat in Star Wars: Armada. Yes, it’s all Star Wars all of the time lately, and we still have a brand new film on the way. No pressure, Mr Abrams. Thankfully, this isn’t just a cash-in super-size of X-Wing, but an original, engaging, tactical spaceship combat game that’s probably the best of its type. It sure ain’t cheap – the starter set could certainly have been better value – and a flow of expansions will keep you dipping into your wallet, but it does capture the feel of huge, lumbering spaceships with a clever system that forces you to order your ships ahead of time – the more turns ahead, the larger and more ungainly the ship. Around the big ships zip squadrons of TIE fighters and X-wings like busy gnats, and I think it’s the contrast between the two systems that control the ships and the squadrons that gives the game its epic feel. 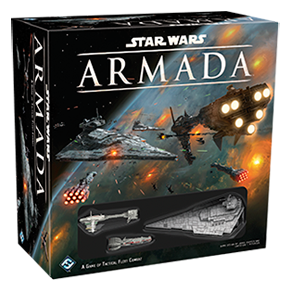 FFG are releasing a campaign for Armada. Although I never bought the game, this is the sort of thing that might have enticed me. Don’t recall them doing this for X-Wing, which is perhaps the only thing that could entice me to blow the dust of small fortune I spent on ships (I kicked the habit a few waves ago). I really like the format of these rules vs the OEM rule set as it reads in a logical order. Would love to see 1.2 update do include some the later expansion rules and possibly rules on the Corellian conflict campaign. Thanks for making this! You’re welcome! Like X-Wing, it’s difficult for me to keep these sheets updated without buying absolutely everything for each system, which I can’t do, so this may stay at the core rules for now.